Judd’s & Jackson’s will have a special St. Pat’s menu featuring Bangers & Mash, Corned Beef & Cabbage, Potato Crusted Salmon Fillet, an Irish Burger, and a selection of drinks. Join us for a peaceful celebration of 2018! For those of you looking for a quiet evening of celebration, we are open! We have a special holiday menu selected for the night. Start your meal off with a crisp Caesar salad, a selection of savory soups, and Clams Casino baked to perfection. New to the menu is Halibut Fruits De Mer and Lobster Ravioli. Make your reservations today 215.675.6000. Please remember folks, we are open for dinner only this day. REMINDER: the game has been moved from 1 to 4:25PM against the Redskins. Don’t miss any of the action! 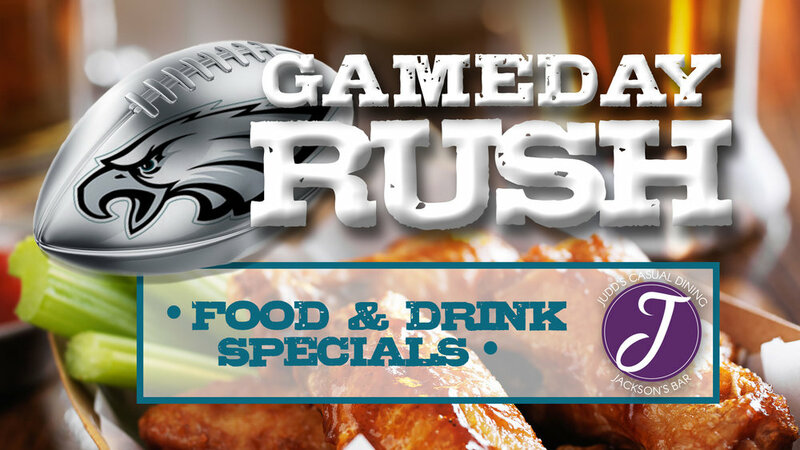 Come in on Eagles gamedays for our Gameday Rush at Judd’s & Jackson’s. Food and drink specials will be offered throughout the duration of the game. Cheer, shout, holler with your fellow fans! Judd’s & Jackson’s lounge is cozy with big screen TV's around the bar if you are looking for a place to watch the game in Southampton. If you are up for it, you will need both hands to hold one of our extra large martinis! We rotate our taps with seasonal craft beers and carry your favorite standbys. Jackson’s offers happy hour specials and a full bar. Closed Mondays. Judd’s is open to the public, please join us! Fly Eagles Fly! Come cheer the on Eagles! The game starts at 1PM against the Texans. Don’t miss any of the action, come in on Eagles gamedays for our Gameday Rush at Judd’s & Jackson’s. Food and drink specials will be offered throughout the duration of the game. Cheer, shout, holler with your fellow fans! Come cheer the on Eagles! The game starts at 8:20PM against the Rams. Come cheer the on Eagles! The game starts at 4PM against the Cowboys. The game starts at 1PM against the Giants. Don’t miss any of the action! Judd’s & Jackson’s is closed Mondays. Have a peaceful dinner with your family and enjoy their company! Spring Mill has your whole meal planned from start to finish! No cooking, no cleaning, no mess! 6% Sales Tax & 20% Gratuity Added to all Checks. Hand Carved to Order, Carved Turkey with Giblet Gravy, Carved Honey Mustard Glazed Ham. Mashed Potatoes, Candied Yams, Baked Sweet Potatoes, Green Bean Casserole, Succotash with Pearl Onions, Fresh Garden Medley, Salmon Fillet with Lemon Dill, Tortellini Pasta with Mushroom Alfredo Sauce, Chicken Francaise, Rice Pilaf, Homemade Stuffing, Fresh Cranberry Relish. Turkey Corn Chowder, Vegetable Soup, Butternut Squash Soup. Kale Salad, Arugula Salad, Lentil Salad, Caesar Salad, Carrot Salad, Waldorf Cole Slaw, Potato Salad, Fresh Bean Salad, Jicama Slaw with Cranberries and Walnuts Homemade Apple Sauce. Apple Pie, Pumpkin Pie, Fresh Fruit, Assorted Cakes. Rouse that cheer and grab a beer Eagles Gameday Rush is back! The game starts at 1PM against the Saints. Judd’s & Jackson’s lounge is cozy with big screen TV's around the bar if you are looking for a place to watch the game in Ivyland. If you are up for it, you will need both hands to hold one of our extra large martinis! We rotate our taps with seasonal craft beers and carry your favorite standbys. Jackson’s offers happy hour specials and a full bar. Closed Mondays. Rouse that cheer and grab a beer Eagles Gameday Rush is back! The game starts at 8:20PM against the Cowboys. Judd’s & Jackson’s lounge is cozy with big screen TV's around the bar if you are looking for a place to watch the game in Richboro. If you are up for it, you will need both hands to hold one of our extra large martinis! We rotate our taps with seasonal craft beers and carry your favorite standbys. Jackson’s offers happy hour specials and a full bar. Closed Mondays. The game starts at 1PM against the Panthers. Don’t miss any of the action! Come cheer the on Eagles! The game starts at 1PM against the Texans. The game starts at 8:20PM against the Giants. Rouse that cheer and grab a beer Eagles Gameday Rush is back! The game starts at 4:25PM against the Vikings. The game starts at 1PM against the Titans. Don’t miss any of the action! Judd’s & Jackson’s lounge is cozy with big screen TV's around the bar if you are looking for a place to watch the game in Montgomery County. We rotate our taps with seasonal craft beers and carry your favorite standbys. If you are up for it, you will need both hands to hold one of our extra large martinis! Jackson’s offers happy hour specials and a full bar. Closed Mondays. Welcome back the Super Bowl Champs!!!! Rouse that cheer and grab a beer Eagles Gameday Rush is back! The game starts at 1PM against the Colts. Judd’s & Jackson’s lounge is cozy with big screen TV's around the bar if you are looking for a place to watch the game in Warminster. We rotate our taps with seasonal craft beers and carry your favorite standbys. If you are up for it, you will need both hands to hold one of our extra large martinis! Jackson’s offers happy hour specials and a full bar. Closed Mondays. Eagles Gameday Rush!-watch the game! Welcome back the Super Bowl Champs!!!! Rouse that cheer and grab a beer Eagles Gameday Rush is back! The game starts at 1PM against the Buccaneers. Judd’s & Jackson’s lounge is cozy with big screen TV's around the bar if you are looking for a place to watch the game in Bucks Country. We rotate our taps with seasonal craft beers and carry your favorite standbys. If you are up for it, you will need both hands to hold one of our extra large martinis! Jackson’s offers happy hour specials and a full bar. Closed Mondays. Welcome back the Super Bowl Champs!!!! Rouse that cheer and grab a beer Eagles Gameday Rush is back! The game starts at 8:20PM against the Falcons. Celebrate Cinco De Mayo with our special Mexican Cuisine menu and drink specials. What a day it will be! It's Derby Day too! Bourbon Drink specials and wear your best hat for our contest! $10 Blind Draw on the ponies! We will have the Kentucky Derby coverage on, place your bets! It's the last day to take advantage of our Visit Bucks County Restaurant Week special menu. We are excited to announce our participation in Visit Bucks County first-ever Restaurant Week! Countywide Restaurant Week is from Sunday, April 29 to Saturday, May 5. Choice One Appetizer: cheese steak pot stickers, house made mozzarella sticks or fried calamari. Choice One Entrée: chicken napoleon, pan roasted salmon fillet or bacon wrapped pork filet. Dessert: fresh fruit tart with berries and lemon sorbet. Judd’s & Jackson’s is having a special night! Enjoy a variety of oysters served with a selection of mignonettes. Cupid’s Arrow-Maine, Great White-Massachusetts, Savage Blonde-Prince Edward Island, Well Fleet-Massachusetts, Drunken Kiss-California. Clams on the 1/2 shell will be offered as well. Food and drink specials available through the duration the game. Goose Island IPA $4.00 pint. Miller Lite $2.50 pint. $.50 cent wings available through the duration the game. Go get em! Gameday Specials for Thursday: Goose Island IPA $4.00 pint Miller Lite $2.50 pint $.50 cent wings! through the duration the game. Goose Island IPA $4.00 pint Miller Lite $2.50 pint $.50 cent wings! through the duration the game. Eagles Gameday Rush! Food and drink specials during the game! Judd’s & Jackson’s will be offering Goose Island IPA and $4 buffalo chicken bites for all football fans through the duration of the game. Stop in on this Sunday to cheer with your fellow fans. Remember we are closed Mondays. Stop in and sample the finest picked oysters of the west and east coast! Sold by the piece, shucked fresh for you at the time of your order! What can be better? How about a selection of specialty sauces to make your mouth water!